After trimming the edges to hide the plastic, I started planting. Some of the Iris, Ligularia and Persicaria had been sitting in the garage for almost 2 weeks and need some TLC. I am not concerned that any of them will not survive (they are all tough as nails) but they may need the rest of the summer to recover. The back bog is a bit squishy (good), but I hope not too squishy. This is really an experiment as to what water loving plants like what conditions. A lot of sun hits these beds in the afternoon, but the two Oaks are starting to leaf out so that can change. The back edge drops off onto the lawn. 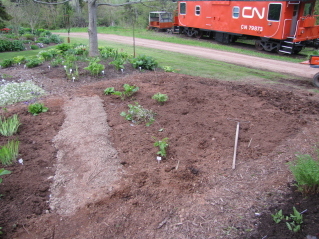 We added a 2 ft bed there, before we reached the lawn and some of the Lungwort and Ferns are going there. We need a bit of sod and grass seed to repair the lawn. The poor Lungwort looks pathetic when the sun hits it. It did not like to be moved.﻿ But it will recover. 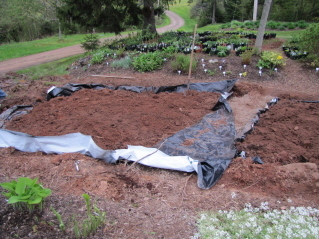 A nice thick layer of compost will complete the look. ﻿ Doesn't the garden phlox look great. Just covered with masses of blooms. 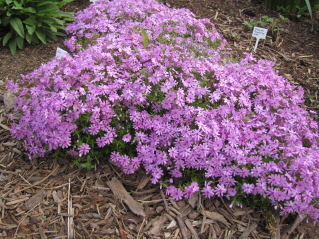 This one has pale pink blossoms with slightly greying foliage. 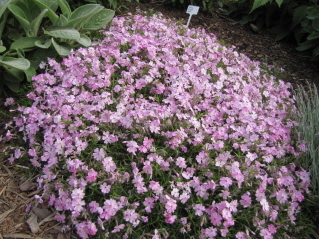 Creeping Phlox or Moss Pinks have been around for years. 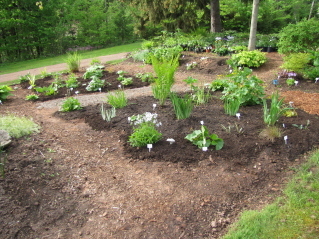 They are low growing (about 6") creeping, evergreen plant considered by some as ground covers spreading to 2'. They have small flowers in dense clusters of red, white, blue, pink, rose, lavender, purple as well as bicolours. Easily grown in full sun with well drained soil (not a bog) and benefits with the addition of compost. Easily divided in the spring and quite commonly found in spring plant sales.